Cooking is the least thing I would like to do when I was a teenager, as also fortunate while we are growing, we have some help from relatives that my parents. They live with us and in exchange for that, they usually help my family with the household chores, and one of that is preparing our meals. Growing up, I only knew meal preparation such as frying and cooking rice. Nevertheless, other than that, it is blah! I wasn’t forced to learn as I’m the second to the youngest and since we have my relative as our cook, I only help her with the preparation. Therefore, I struggle on how to come up with the great flavor when I started to cook for my husband, son and myself. Good thing, nowadays we have the cookbook. They have the precise amount of measurement of the ingredients. I know I need help; I’m willing to learn for more. Now as my MIL gave me a cookbook full of great recipes, I started to use it and then I’ve started to cook meals that are based on the recipe inside. 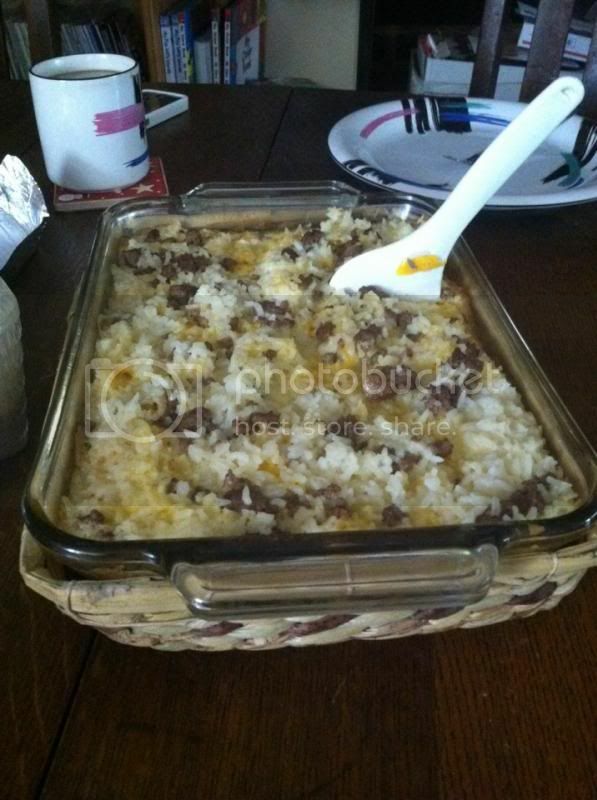 Today, I created Rice and Chicken Casserole, but instead of chicken, I used the ground beef. I added some seasoning, as I would like to have more flavor rather than a plain one. In the end, we all enjoyed it since then, I started to use the cookbook as much as possible. Ohh I can totally relate!! As I was growing up, I was a very spoiled. I was always depending on my Grandmother to whip up delicious meals for me and I couldn't even be bothered with just BEING in the kitchen with her watching her cook just so I would learn a little but noooo I had better things to do back then lol. Honestly, it wasn't till I got married earlier this year when I really started cooking and also my now 7-year old had started to request dishes that my grandma cooked so I decided I HAD to start learning because my husband was doing all the cooking AND he was working full-time as well so that was the least I could do to keep him happy aside from keeping the house spotless. Anyways sorry for the long comment! But I Love your blog and if you don't mind I'll be adding you to my links! God Bless!! Shocks - this seems soo yummy and fulfilling! I have a hard time cooking and sometimes, following cookbook recipe still ends up in failure but I still try as its really fun! Plus, I really need more practice. The rise casserole looks really delicious. I haven't done any rice casserole yet, sounds delicious! I loved cooking...I loved eating...your rice casserole bake looks delicious. You can add some other ingredients for another level of tastes.